Fold the flour and egg mixture in together until thoroughly mixed and now fold in the chocolate and butter mixture. Finally, add the yoghurt to this and mix in thoroughly. Spoon the mixture into the prepared tray and bake for about 25 minutes or until the sponge springs back when pressed. Once slightly cooled prick small holes into the surface of the cake with a skewer or sharp knife and brush a quarter of the jam over the surface. This will allow the jam to run through the cake slightly and make sure it is nice and moist! Cut the squares into half sideways – see images (it is best to do this one at a time… otherwise you will lose the matching top and bottom!) and spread a small amount of jam in the middle and then put back together like a sandwich, pressing down slightly, so that they are firmly together. 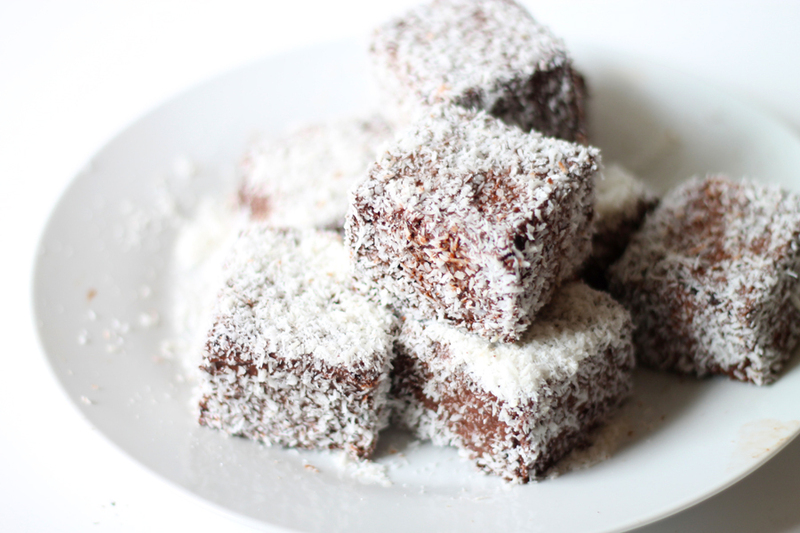 Brush the glaze onto the outside edges of the lamingtons (i left the bottom unglazed so that it was easier to handle and less messy) and roll gently in the coconut flakes until fully covered. In a pot mix together the jam and water and warm up, while mixing. Melt the chocolate in a pyrex bowl over a pot of boiling water on the stove and brush onto lamingtons with a pastry brush.